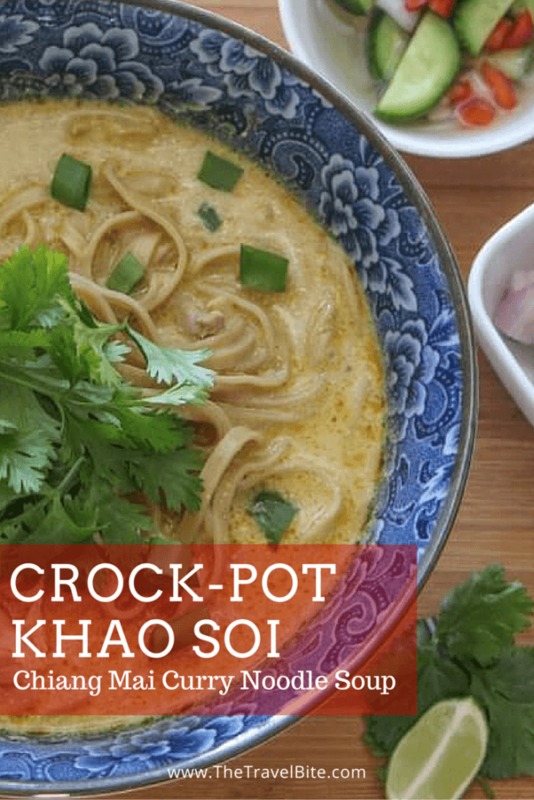 Khao soi – the coveted Thai coconut curry noodle bowl popular in Northern Thailand. 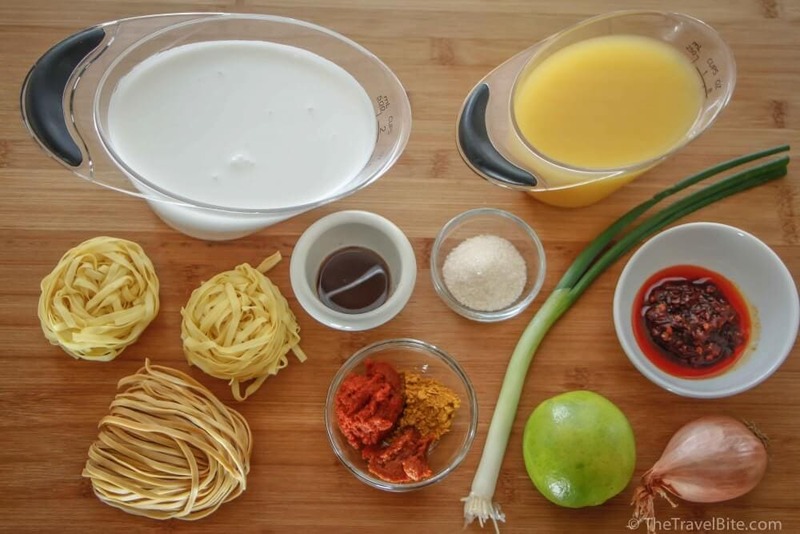 During my first visit to Chiang Mai, I took a cooking class to learn how to make Khao Soi. And while it was delicious when I tried the recipe at home, it just didn’t quite taste the same as what I had Thailand. So, during our latest visit to Chiang Mai, we ate loads of khao soi to decipher every flavor and lingered around the large woks at the front of food stalls to observe how it’s made. The trick, I’ve figured out, is in the simmer. That, and finding good quality ingredients. After tweaking my last recipe for curry noodles and several test runs at home, I’ve finally conquered making crock-pot khao soi at home. Our last few batches based on this recipe below instantly bring us back to our favorite noodle bowls in Chiang Mai. First, let’s talk about ingredients. 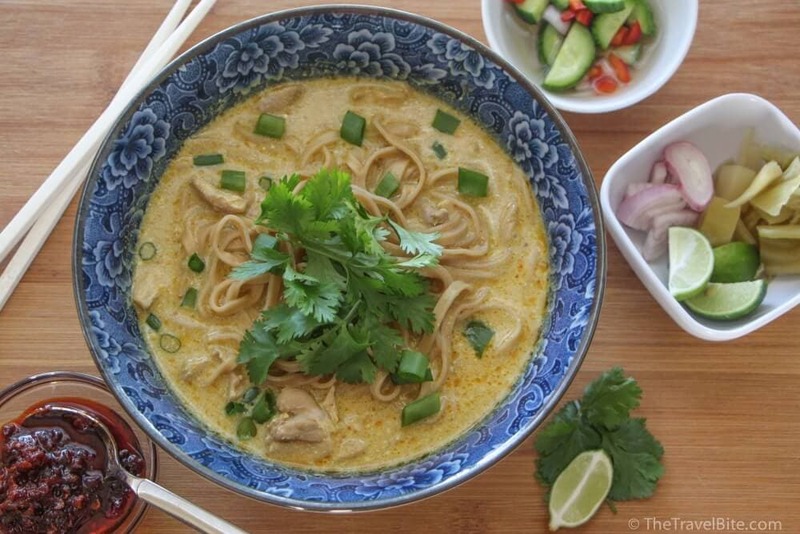 Khao soi is a coconut based curry with egg noodles, chicken (sometimes beef), green onions, shallots, and a squeeze of lime. It packs a whole mouthwatering bite of umami that makes it memorable and comforting, and that umami really sets in when you allow the ingredients to simmer. 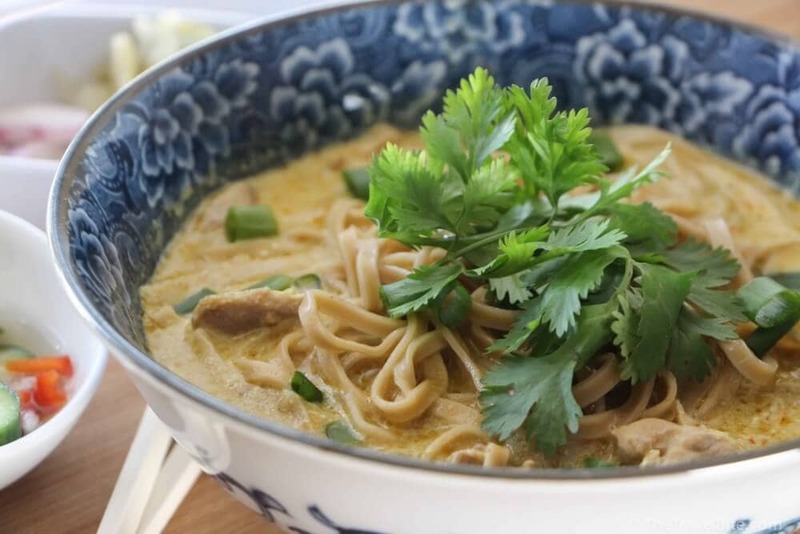 A note about picking the right noodles: Khao Soi is traditionally made with egg noodles. They’re heartier and the sauce seems to stick to them (just like Bolognese sticks to tagliatelle). That being said, it’s okay to use vegetarian noodles if you can’t find egg noodles. The vegetarian noodles are a bit lighter and take less time to cook. With either noodle, look for a package where the noodles are individually portioned like little nests. This makes it so much easier to cook just what you need and store the rest for later. Otherwise, you get a big pot of tangled mess. 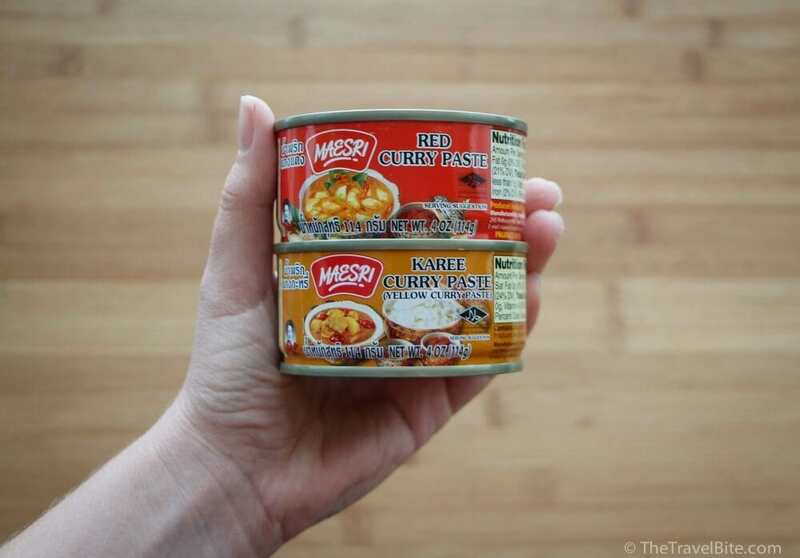 When looking for the curry, find Thai-made red curry paste and yellow curry paste if you can. 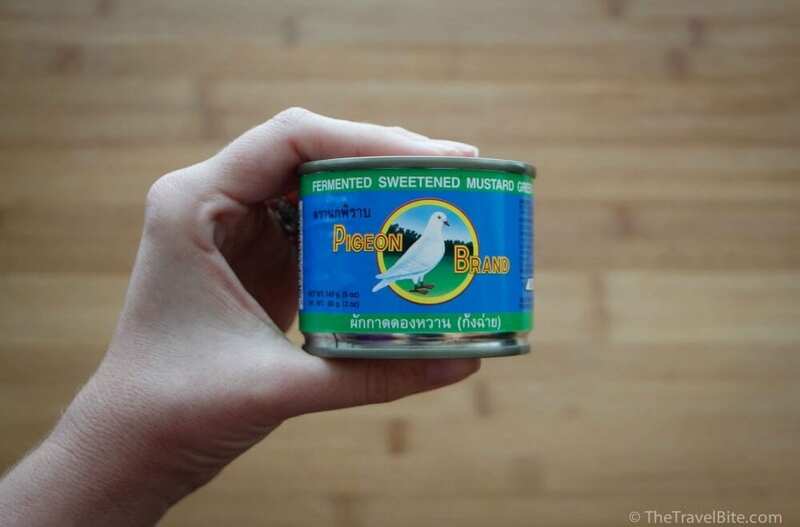 The ingredients of each are pretty similar, but the yellow curry paste tends to have a more aromatic floral scent while the red curry paste isn’t as complex. By the way, both look ‘red’ when you open the can, so it is easy to get the two confused. If you mix them up, you can tell them apart by the scent. In Thailand, pickled mustard greens are typically served as a side dish with khao soi along with a cucumber salad and slices of small red onions and lime. 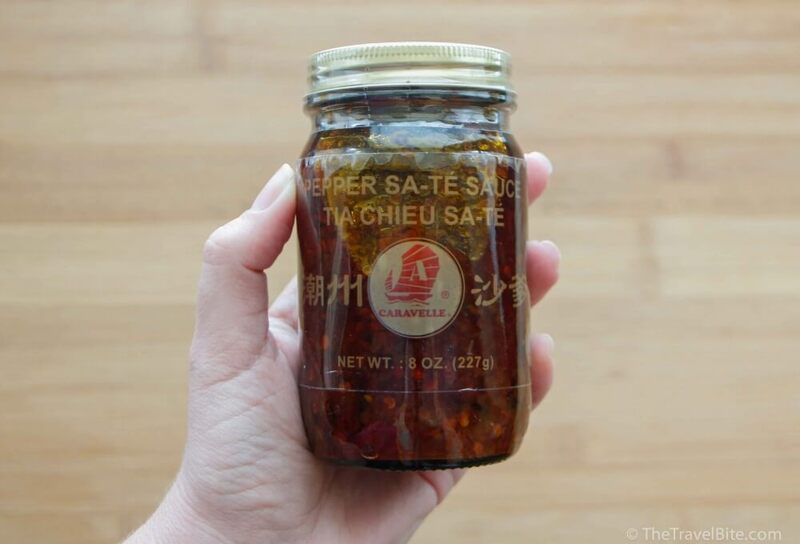 If you see this at your local market, definitely pick some up to serve on the side. This pepper in oil is what makes khao soi Thai coconut curry noodle bowls go from mild to “Thai Hot.” It’s also what give Khao Soi that rim of flavorful orange oil on the top. Save this to have on the side and add to your bowl one small spoonful at a time to control the heat. Now, for what you’ll pick up at your local grocer or farmer’s market. I recommend dark meat chicken as it is more flavorful (more authentic too) and is perfect for a slow cooker. White meat tends to get hard and chunky. Follow the recipe below, prepping the garnish to set aside and adding the curry ingredients and chicken thigh meat to a crock-pot. Stir everything together and turn heat to high and let it simmer in a low boil for 4 hours. 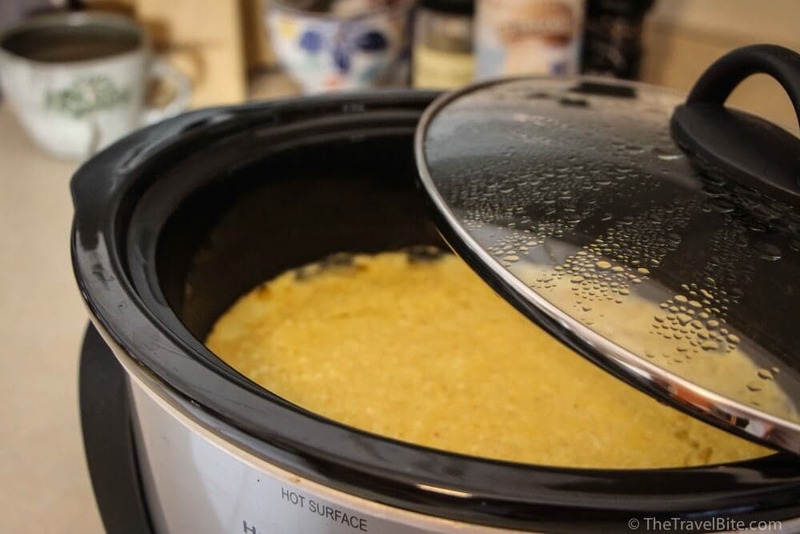 If you’re going to make it in the morning and want it to be ready when you get home from work, set your slow cooker setting to low and simmer for 7 to 8 hours. Once the curry is done, boil a pot of water to cook your noodles. 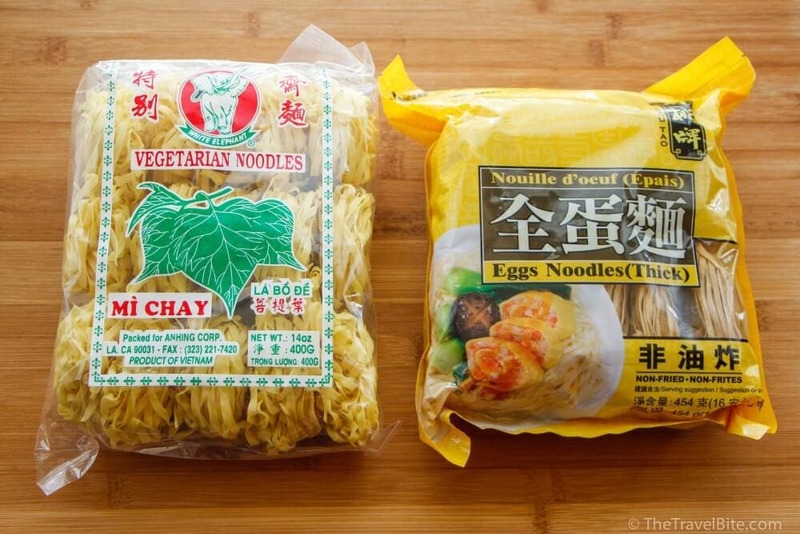 One noodle nest equals a one-bowl serving and they take 2-7 minutes to cook depending on package directions. Remove skin and bones from chicken thigh meat and chop into small rustic chunks. 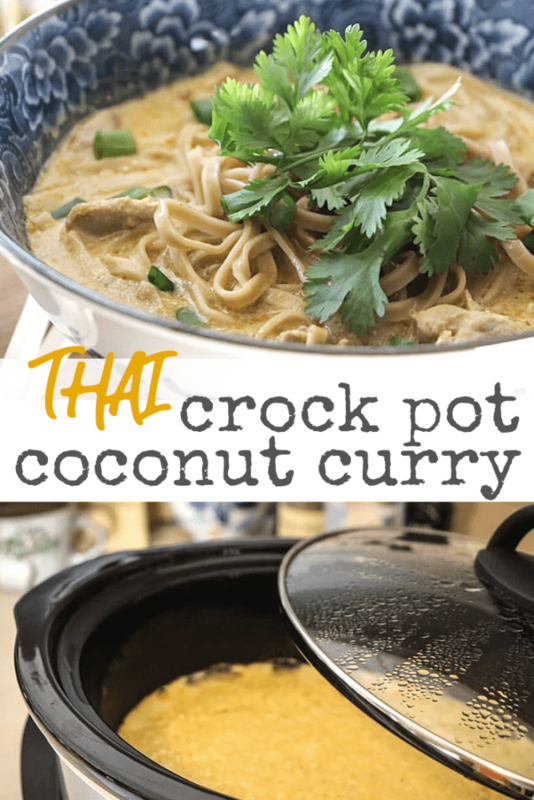 Add chicken, coconut milk, chicken stock, yellow curry paste, red curry paste, yellow curry powder, sugar, and fish sauce to slow cooker. Stir, cover, and set heat to high. Allow to cook for 4 hours (or, simmer for 8 hours with setting on low). Cook individual servings of noodles according to package directions, drain and place in bowls. 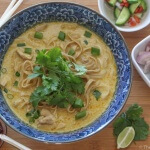 Spoon 1-2 cups of khao soi curry broth over noodles and garnish with green onion and cilantro. Serve with a side of shallots, lime, and pickled mustard greens. Add small amounts of chili oil to individual bowls to increase the spiciness to your own taste (or omit if you like it mild). Yum! This looks just like what we had in Chiang Mai! Fell in love with the noodles from Khao Soi Islam, which was just around the corner from our guesthouse (so lucky!). Can’t wait to try this at home, I miss that aromatic curry broth and noodles mix so much. Thanks for sharing! Hi there! Quick question – with my commute and work hours I would have to leave my crockpot on for closer to 10 hours while I’m gone for the day – would it be alright to leave the chicken and broth on for that long, and if so should it be on Low or on Simmer? Thank you, can’t wait to try this! I think it should be fine! The longer it simmers, the more tender the chicken. Keeping it on low should be good. This was so delicious! Just like we had in Chiang Mai. So easy to make – it’ll now be in our permanent rotation since we know where to get all the unique ingredients.